How Are Powder Coatings Manufactured? Let's concentrate on powder coating manufacturing today by taking a look at how the resins and additives mix to create the protective coating. The hypothetical manufacturing facility we're taking a walk through obviously knows all the ins and outs of the medium, so their tech-speak is all about resins and flow additives, but we're looking beyond these ingredients. We want to know the mechanics of the process. 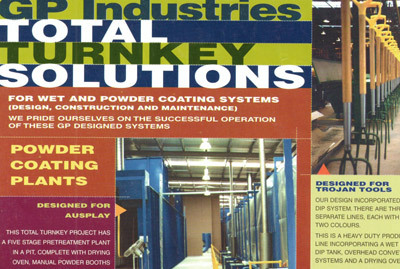 In point of fact, we want to know just how powder coatings are manufactured. This is a solvent-free environment. There's no oil-based or chemical soups here. They're replaced by plastic resins and a host of other dry additives. A pigment and texture agent is one of the main ingredients, as is a hardener and flow enhancer, but the base constituent is always the resin. This cohesive substance is made from either a thermoplastic or a thermoset, two polymer types that incorporate different sets of material characteristics. Basically, thermoplastics melt and flow readily. Thermosets, on the other hand, resist flow but can harden rapidly to form a robust skin. The powder production phase is where much of the customization work is conducted. The ingredients are tailored so that certain flow characteristics and hardening features are emphasized. Next, they need to be mixed. A premix chamber is filled with the proprietary mix. Now that they're uniformly distributed by the tumbler, the raw materials are ready to be converted into a substrate. That's a task that's best left to the heating and extrusion station, a place where the ingredients soften until they assume an amorphous form. The various elements have been mixed and extruded. Let's take the tumbled and extruded mix and grind its newly hardened mass into a powder "micronising" mechanism pairs with a centrifuge to pulverize the hard chips of heat-extruded stuff. 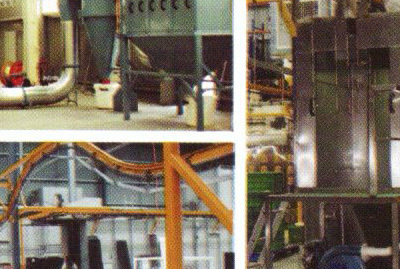 The grinding machinery sieves the powder while the centrifuge separates the finer grains from the heavier particles. Once concluded, a quality-controlled assessment stage deems the product ready for packaging. Remarkably, this whole process has been conducted without any liquids or pollutants. The base resins and additives described above are mixed according to masterbatch compounds and complex formula cards, but they're still dry because dry carriers have absorbed the liquid chemicals before the premix takes place. 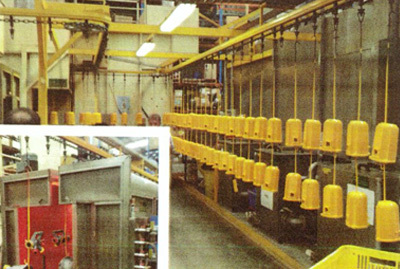 Moving onward, the tough and decorative powder coatings are then heat-extruded and ground down into their final particulate form, all so that they can electrostatically cover a workpiece and flow properly in a hot oven.